This pocket sized thermometer reads in degrees Fahrenheit by simply pushing a button on its face. Holding the button down provides continuous readings. It comes with a replaceable CR2032 Lithium Button Cell Battery for long life. It has a loop in the case for attaching it to a key chain or tool ring. Dimensions: 3.57" x 1.42" x 0.52 (9.0cm x 3.6cm x 1.32 cm) Temperature Range: -27F to 390F. This great clock can is always on time, and automatically updates. 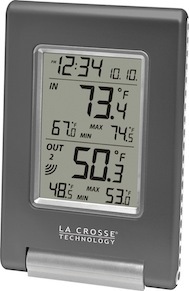 It is perfect to monitor indoor or outdoor temperatures. It can even be expanded to monitor your fridge temperature or the temperature in your compartments. This radio receives all 7 NOAA weather channels and even warns when severe weather is in your local area. It features a replaceable lithium-ion battery with twice the capacity of it's competitors. The radio can also be charged through the built in solar panel or dynamo. Other features include an integrated high intensity LED flashlight, and a Mini USB port.